There’s nothing quite like heading to happy hour with your coworkers after a long day at the office. And while an adult beverage can seem like just what you need after working 9 a.m. to 5 p.m., it’s the bar snacks offered at these local establishments that serve as the icing on your hard-earned cake. This is a sentiment we share with all of you, so we compiled a list of a few of our favorites. From nachos and wings to long hots and melts, we’re sure you won’t be leaving happy hour hungry. Is there anyone who doesn’t like nachos? We didn’t think so. 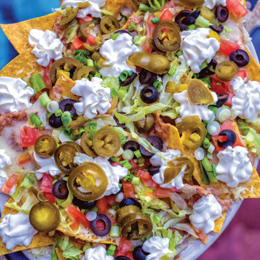 These nachos are complete with all the fixins’—refried beans, melted cheese, lettuce, tomatoes, olives, scallions, sour cream and jalapeños piled high on top of homemade tortilla chips. We recommend tossing on chorizo for an added spice in every bite and a margarita to wash all of it down. When happy hour meets comfort food, there’s no way we can’t order this dish. The classic mini pigs in a blanket take a twist at The Pour House with full-sized hot dogs being wrapped at length with biscuit dough and baked to perfection. To top it off, it’s served with beer mustard to give it just enough kick and to complement your choice of draft. If you like a little bit of kick to your bar snacks, look no further than the Stuffed Long Hots at Ott’s. The juicy long hot peppers are stuffed with ham and provolone cheese, brushed with a garlic-and-oil mix and baked to perfection, then served with an Italian roll. If you don’t finish them, we will. Pretzels are one of the best foods to pair with beer, and Iron Hill takes it up a notch by pairing its pretzel sticks, covered in everything spice, with dipping sauces made with—what else— their housemade beer. Both sauces—Vienna Red Lager cheese sauce and Ore House IPA mustard—are finger lickin’ good. A mix of tender crab meat, cream cheese, spices and fresh herbs served with crispy Old Bay potato chips to scoop up all the creamy goodness makes this the ultimate savory dish. It’s so tasty, you may end up rethinking sharing this dish with those around you. Take Miller’s Ale House’s famous Zingers—handbreaded chicken tenders tossed in an addicting garlic sauce—and pile them on top of fries smothered in Monterey Jack and cheddar cheese, applewood smoked bacon and green onions. Choose between blue cheese and ranch dressing as a dipping sauce and you’ve got a party in your mouth. Or as we like to call it, the leaning tower of onion rings. A dish easily meant for at least a few people to share, you might do a double take like we did when this dish was placed in front of us. An abundance of beer-battered, parmesan onion rings are stacked what seems like a mile high and paired with not one, but two different kinds of ranch—chipotle and buttermilk.